Lately, we find ourselves lamenting the post-truth world, in which facts seem no more important than opinions, and sometimes less so. We also tend to see this as a recent devaluation of knowledge. But this is a phenomenon with a long history. Anti-intellectualism has been a constant thread winding its way through our political and cultural life, nurtured by the false notion that democracy means that “my ignorance is just as good as your knowledge”. The view that opinions can be more important than facts need not mean the same thing as the devaluing of knowledge. It’s always been the case that in certain situations opinions have been more important than facts, and this is a good thing. Let me explain. To call something a fact is, presumably, to make a claim that it is true. This isn’t a problem for many things, although defending such a claim can be harder than you think. What we think are facts – that is, those things we think are true – can end up being wrong despite our most honest commitment to genuine inquiry. For example, is red wine good or bad for you? And was there a dinosaur called the brontosaurus or not? The Harvard researcher Samuel Arbesman points out these examples and others of how facts change in his book The Half Life of Facts. It’s not only that facts can change that is a problem. While we might be happy to consider it a fact that Earth is spherical, we would be wrong to do so because it’s actually a bit pear-shaped. Thinking it a sphere, however, is very different from thinking it to be flat. Asimov expressed this beautifully in his essay The Relativity of Wrong. For Asimov, the person who thinks Earth is a sphere is wrong, and so is the person who thinks the Earth is flat. But the person who thinks that they are equally wrong is more wrong than both. Geometrical hair-splitting aside, calling something a fact is therefore not a proclamation of infallibility. It is usually used to represent the best knowledge we have at any given time. It’s also not the knockout blow we might hope for in an argument. Saying something is a fact by itself does nothing to convince someone who doesn’t agree with you. Unaccompanied by any warrant for belief, it is not a technique of persuasion. Proof by volume and repetition – repeatedly yelling “but it’s a fact!” – simply doesn’t work. Or at least it shouldn’t. Then again, calling something an opinion need not mean an escape to the fairyland of wishful thinking. This too is not a knockout attack in an argument. If we think of an opinion as one person’s view on a subject, then many opinions can be solid. For example, it’s my opinion that science gives us a powerful narrative to help understand our place in the Universe, at least as much as any religious perspective does. It’s not an empirical fact that science does so, but it works for me. But we can be much clearer in our meaning if we separate things into matters of fact and matters of opinion. Matters of fact are confined to empirical claims, such as what the boiling point of a substance is, whether lead is denser than water, or whether the planet is warming. 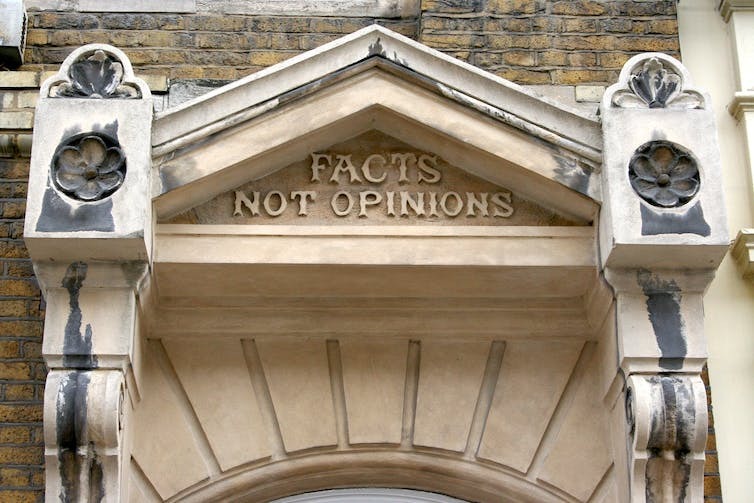 Matters of opinion are non-empirical claims, and include questions of value and of personal preference such as whether it’s ok to eat animals, and whether vanilla ice cream is better than chocolate. Ethics is an exemplar of a system in which matters of fact cannot by themselves decide courses of action. Matters of opinion can be informed by matters of fact (for example, finding out that animals can suffer may influence whether I choose to eat them), but ultimately they are not answered by matters of fact (why is it relevant if they can suffer?). Opinions are not just pale shadows of facts; they are judgements and conclusions. They can be the result of careful and sophisticated deliberation in areas for which empirical investigation is inadequate or ill-suited. While it’s nice to think of the world so neatly divided into matters of fact and matters of opinion, it’s not always so clinical in its precision. For example, it is a fact that I prefer vanilla ice cream over chocolate. In other words, it is apparently a matter of fact that I am having a subjective experience. But we can heal that potential rift by further restricting matters of fact to those things that can be verified by others. While it’s true that my ice cream preference could be experimentally indicated by observing my behaviour and interviewing me, it cannot be independently verified by others beyond doubt. I could be faking it. But we can all agree in principle on whether the atmosphere contains more nitrogen or carbon dioxide because we can share the methodology of inquiry that gives us the answer. We can also agree on matters of value if the case for a particular view is rationally persuasive. Facts and opinions need not be positioned in opposition to each other, as they have complementary functions in our decision-making. In a rational framework, they are equally useful. But that’s just my opinion – it’s not a fact.